We’ve established a strong relationship with selected Oaxacan artists who stand out for their originality and quality of work. Each has a very individual style, and will be delighted to work with you to create a bespoke piece. 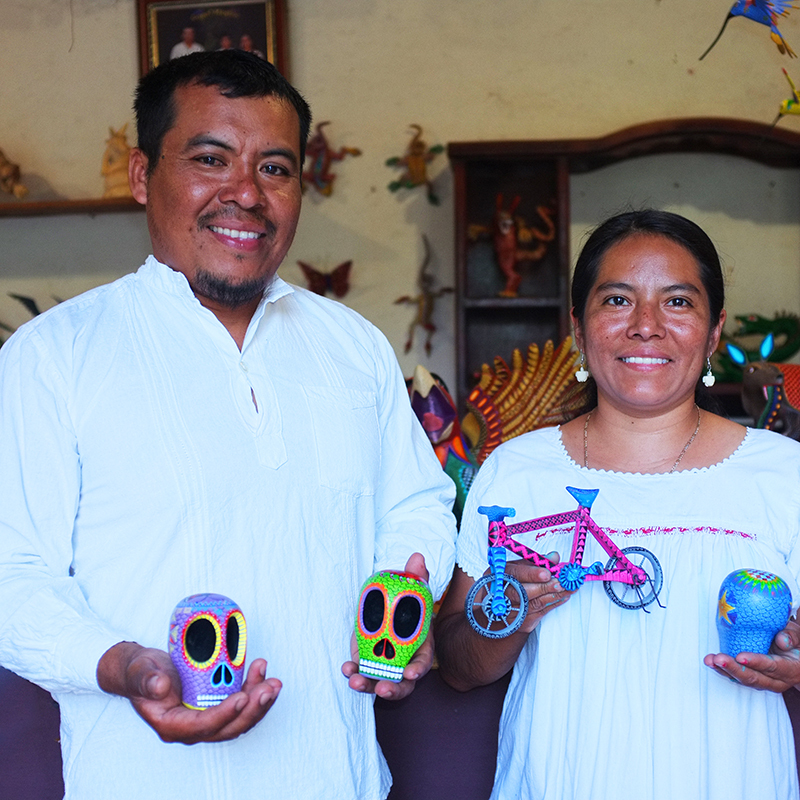 Jacobo and Maria Angeles have the most renowned alebrijes workshop thanks to their impressive painting and innovative carving. Their workshop has grown so much that now many selected artists work with him, they specialise either in painting or carving and work in teams to create the most incredible pieces. He has featured in multiple publications and his work has been displayed in museums. Jacobo appears in one of BBC4’s ‘Handmade in Mexico’ episodes, so check it out! 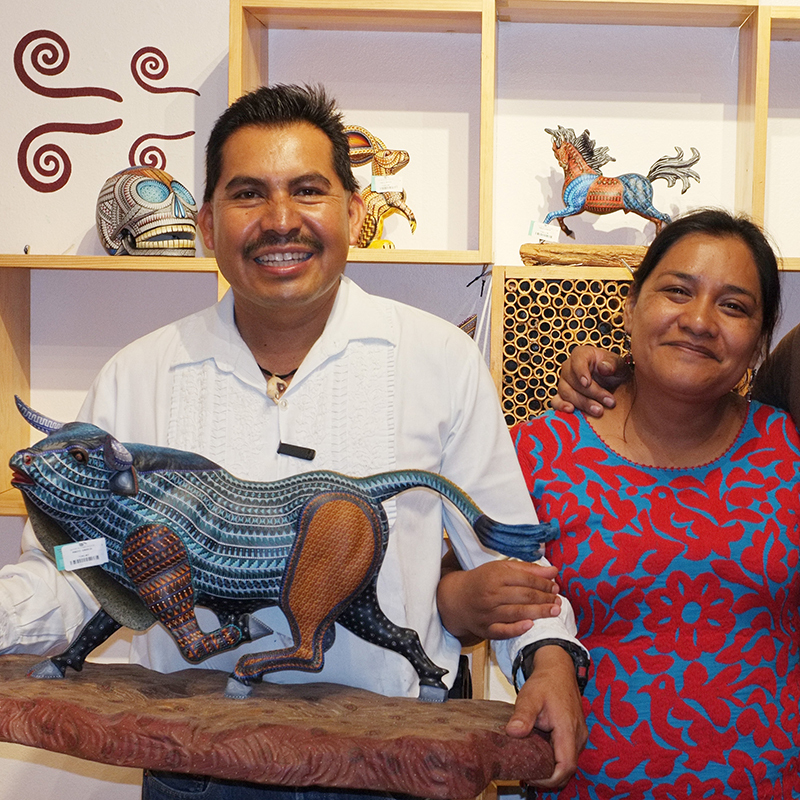 Manuel is the son of one of the masters of Oaxacan wood carving, Agustin Cruz Tinoco, known for his religious icons. He has certainly inherited his father’s talent for precise and complex carvings, but has his own distinctive style. He collaborates on the decoration with his wife Ruvi Martinez, a talented and innovative painter in her own right. Manuel was awarded first places in the 2016 MEAPO-FOFA awards (for Mexican folk artists), and the 2017 Benito Juarez Popular Art State Competition. He has participated in the prestigious Folk Art Market in Santa Fe, New Mexico. Copal Mágico is a workshop formed by Jesus Hernandez and Roxana Ortega. Their style is especially distinctive thanks to their painting which resembles a scale pattern. They use needles and agave thorns to paint the finest details. 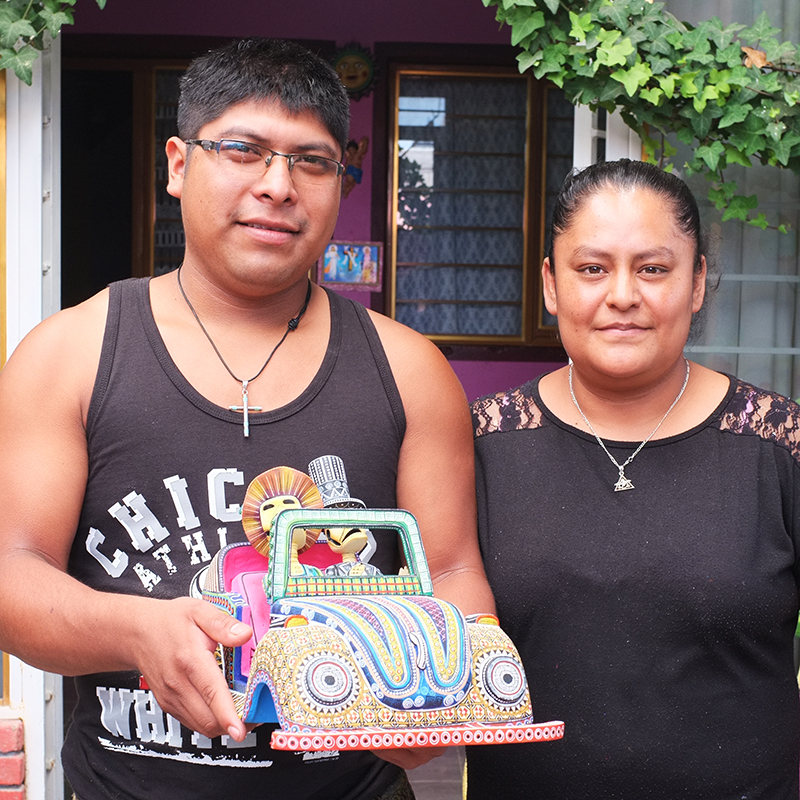 Their pieces have been exhibited in Mexico, Barcelona, Brazil, USA and they have won several awards, among them the ‘Mexican Popular Art Toy National Contest’ and the ‘Mexican Nativity Scene National Contest’. In December 2015 Jesus was the first prize winner in the ‘Grand Masters of Mexican Craft’ contest for a carving of a lottery card game with three-dimensional pieces.